Have you gone into a videogame store recently? I don’t mean just navigated your way to a web store either. I mean an actual flourescent-lit, sticky carpeted, grouchy-teen filled bricks and mortar shop. Nevertheless, should you have found yourself in such a place (maybe your better half was knees deep in Monsoon and you JUST COULDN’T TAKE IT ANYMORE… for instance), you’ll have no doubt noticed that pretty much every mainstream game you can buy is an FPS, a driving game, some kind of sandbox-explorathon or FIFA. Which wouldn’t be so bad except for the fact that nearly all of them look and play the same. Games have reached a kind of convergence, where certain tropes, control schemes and methods work well and are understood by gamers. So developers have no incentive to get a bit silly and try something new. If it ain’t broke, etc. I don’t have much of an issue with this. Basically, it means games have started to develop a ‘language’ of their own, which is the sign of a mature medium and can only be a good thing. From here on in it gets really, really strange. And yet. Along with the maturity has come a greater level of homogeny. How many times can the same old sci-fi, post-apocalyptic, militaristic, space marine and steampunk stylings be trotted out and people keep lapping them up? Sega, once a haven of gaming originality, seem to have no idea who they are anymore. Nintendo, meanwhile, have fallen so far into the ‘games for kids’ vortex, it’s not even funny anymore. If you want anything outside of the mainstream, but not “kiddiefied” (or even slightly different from the AAA shooting extravaganzas), you have to dip your toe into the murky world of indie-games. Many of which are stellar. But just as many are about as much fun as a limp, damp handshake. This was not always the case. Back in the creative boom times of videogaming, that glorious period where 8-bit and 16-bit home computers were giving way to a new breed of gaming consoles, originality was par for the course. Granted, quite often the games were a shonky mess. Yet at least they were trying, really trying, to create something new. Something you’d never seen before. Even if the genre of the game was familiar (and let’s face it, technology still wasn’t advanced enough for truly ground-breaking modern game mechanics), it was often approached in a completely new way. 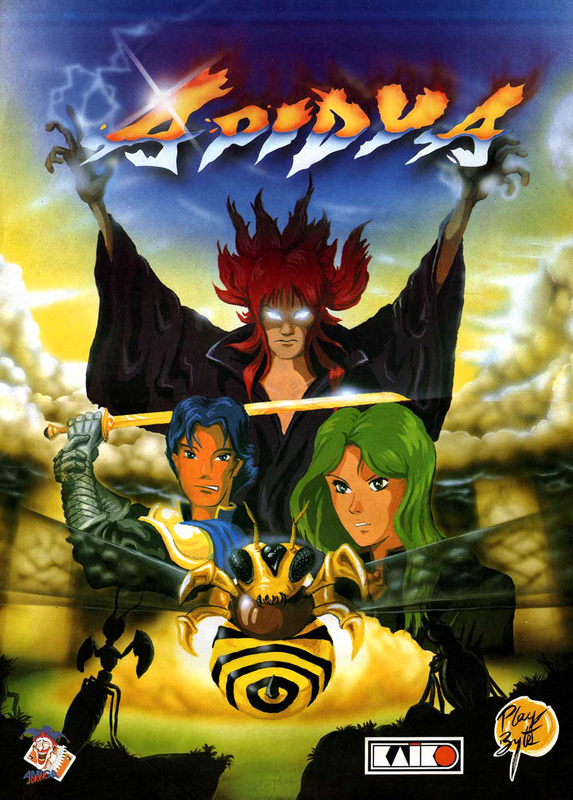 The Apidya box-art. They really don’t make them like this anymore. There’s a bad dude. The bad dude’s name is Hexaae, and he commands vast, mutated insect swarms. For reasons best known only to himself (wrong side of bed, run out of coffee, realised he had crazy Manga hair), he decides to to wreak havoc on a young, peace-loving couple called Yuri and Ikuro. But at least he does it with panache. And a healthy dollop of weird. At Hexaae’s orders, thousands of mutated insects attack Yuri and poison her. Ikuro returns home to find his wife pumped full of poison and dying. So he does what any heart-broken, red-blooded male would do. He turns into a honeybee (really) and begins his quest for an antidote, scouring the garden, a sewer, and some kind of techno-bio-mechanical-cave place. Like you do. This being the early 90s, said quest takes the form of an R-Type style left-to-right scrolling shooter where you tackle all manner of insectoid and mammalian fiends. I’m not sure I want to talk about this. A fine question. And one I’m still not sure how to answer, as Apidya is barking. Like, Crufts if all the pooches got loose and had steaks tied around their necks and all the owners were on acid barking. First, I have to say that Apidya is technically excellent. Gorgeous, well-detailed and beautifully drawn graphics are complemented by a splendid Chris Huelsbeck (yes, of Turrican fame) soundtrack. Despite the lovely visuals and, at times, manically insane number of sprites being thrown about the screen, there’s no slowdown and collision detection is pixel-perfect. A rarity in a game of this vintage. The game itself consists of 5 levels, each divided into stages and filled to the rafters with an incredible variety of enemies, all and attack patterns. Apidya certainly keeps you on your toes. Each level requires a different style of play – this is not just a case of learning attack patterns and then blasting through the game. It’s properly, old-school tough. If your reactions aren’t up to the task, you’ll struggle to get past the first level. Going back to it now, you do get the feeling that it was slightly on the unfair side at times, but then so many games of this era were. When it came to side-scrolling shooters, they were often judged by how difficult they were. It became a real badge of honour and true indication of skill of you could complete something like Apidya on a single continue. Just try something like Thunderforce IV, Gradius, Parodius or U.N. Squadron today and you’ll see what I mean. So far, so standard. Back to the barking. Apidya is genuinely weird. Strange weird, creepy weird and just plain old weird weird. For starters, it’s replete with mid-level and end-level bosses that gradually ratchet up the strangeness to the point where you start looking at your cuppa, suspicious that something’s been dropped into it. 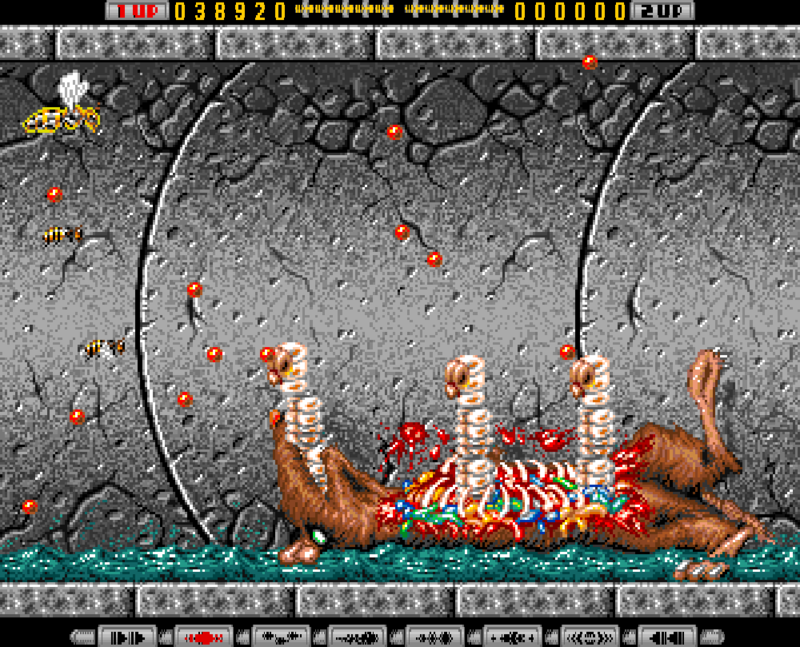 One of the bonus levels. No one has any idea what is going on here. Level 1. Set in a garden, where you battle all manner of creepy-crawlies, before facing off against the terror of a plasma-spewing mole and some kind of hideous, mutated caterpillar. Level 2. As you would traditionally expect, the garden ends in a pond. 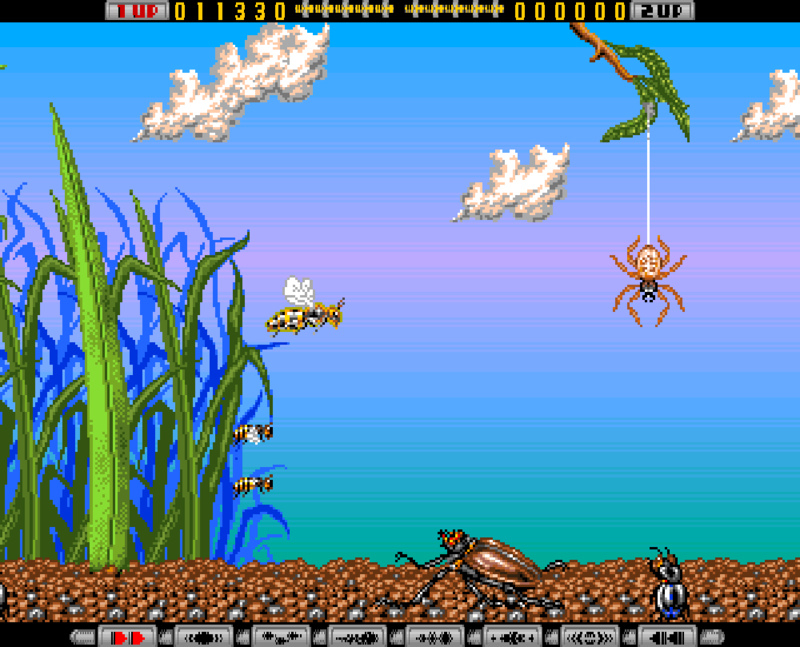 You dive in and out fighting all manner of insectoid and fishy enemies (no, I don’t know how the heck a bee can fly underwater either) before facing off against what appears to be a giant, malevolent pike. As in the fish, not the pole with a stabby thing on the end. Level 3. This is where the weird takes a distinctly “eww” turn. It’s set in a sewer and really does feature the strangest boss battles I’ve ever seen. First, and most memorable, is the dead rat (yes, really) which bursts open to reveal giant maggots that spew fiery death your way. Yuck. This is swiftly followed by a deadly coke can. Nope, me neither. But none of this, none of it, prepares you for the utterly, unspeakably horrifying laser-eyed semi-dismembered rag-doll boss. I still shudder at the thought of it. Level 4. After pausing the game and having a few soothing mugs of tea, you are then faced with a strange, metallic, bio-mechanical world that’s kind of a twisted riff on R-Type (clearly the inspiration for Apidya). Just to really throw you, your bee avatar here morphs into some kind of wasp-cyborg, for absolutely no discernible reason whatsoever. Maybe the developers decided to give us a break at this point, because the end-level boss battle is the most ‘normal’ in the game. Basically, it’s a little flying metal pod thing. Sounds easy, right? Nope. Not only is he deceptively tough, but he’s brought a mate. And his mate’s basically a giant laser that wouldn’t look out of place on the Death Star. Level 5. As if wishing to drive you to some kind of controller based homicide, the final level is just a series of boss-battles, each tougher than the last. Multiple, giant puffer fish fill the screen with their bloated forms. A giant bat-thing does a very good impression of THE MOST ANNOYING THING EVER. You’re assailed by some kind of cyborg clam (I kid thee not), packing a plasma cannon instead of pearls. Then the über-strangeness returns as, to my eternal horror, a mutant heart/face horror spits spiders at you from across the screen. Just as your nerves are shredded almost irreparably,the final boos hoves into view: massive screen-filling hornet. Needless to say, it’s one of the toughest things I’ve ever faced in a videogame. There are also some truly odd bonus stages between levels (one of them takes place inside a giant fish that you’ve just battled). After any kind of extended play, Apidya basically leaves you in need of a long lie down in a dark, quiet room. Of course, all this quirky oddness and insectoid horror would be for nought if it played like a string of old cans. Thankfully, it doesn’t. It wonderfully balanced and tight. Yes, it’s very tough (almost too tough), but stays just the right side of unfair. If you die, it really was your fault. From the Gradius/R-Type hybrid power-up system, crazy visuals and dynamic soundtrack to the fact you could select a ‘Sega’ control system, plug in a Megadrive/Master System pad and benefit from multi-button controllers (still a new-fangled thing then), Apidya was crammed with originality and great ideas. Critically acclaimed at the time, it kind of buzzed under the radar (sorry) and very few Amiga gamers got their hands on it. Now, it’s rightly regarded as a 16-bit classic. Okay, so it was a bit of a fever dream and was television-punchingly tough. But how I wish more modern games had this kind of loose, mad vibe and surreal energy. Not sure about the dead rat though.